When the writers on The Simpsons needed a generic-sounding movie for Marge and Homer to see, sans kids, they came up with “The Stockholm Affair,” a spy thriller plotted enough to make Marge feel smart, but with enough action to entertain Homer. Sydney Pollack’s first film in 6 years is also a very adult affair. It has two bright stars, Nicole Kidman and Sean Penn, both Academy Award winners (as is director Pollack). It’s got an involved espionage plot that makes you feel smart and sophisticated. Plus it has a an explosion and several gunfights to keep the Homers in the audience entertained. Unfortunately, it’s as generic and interchangeable as The Stockholm Affair. 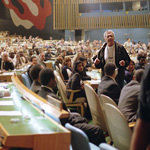 Many U.N. diplomats and workers appear as extras in the film. Nicole Kidman plays Silvia Broome, an interpreter at the U.N. She’s from, basically, South Africa, although for some reason the movie gives it the fictional name Matobo. She speaks English and several African dialects, including Ku, a fictional language that was apparently created for this movie. Silvia returns to work one night to retrieve some things from the sound booth and, while there, overhears a plot to assassinate the Matoban leader Zuwanie. Like Castro, Zuwanie started his career as a freedom fighter and is now more widely seen as a dictator-for-life. He’ll be giving a speech to the U.N. in just a few days to defend himself against charges of unilateral aggression by saying that he was simply pre-emptively protecting his people from terrorism. Silvia reports the overheard, whispered conversation to the authorities, which brings in two agents from a branch of the U.S. Secret Service, Keller and Woods (Sean Penn and Catherine Keener). Their job is to determine if the threat is real and if so, stop it. The hook is that Silvia herself seems to be more involved with the dissident politics of Matobo than she’s letting on. The very first scene of the movie showed an assassination in Matobo, and we don’t know how, or if, it pertains to Silvia. All we know from her conversations with agent Keller is that she is willing to open up, but only to a point. There are two tense set pieces in the film that work wonderfully. Both take their time, letting the suspense build as each minute ticks past. In one, Silvia confronts a Matoban diplomat, trying to get information about her brother. The secret service agents assigned to protect her are trying to keep tabs on her as she moves about New York. Meanwhile, two undercover agents investigating suspects in the plot wind up crossing paths, escalating the danger and the tension of the situation. There is another nail-biting scene at the movie’s climax that is reminiscent of some of the great spy thrillers from the seventies like The Parallax View and Day of the Jackal. A friend pointed out that the first set piece was good not just good because it worked, but because it also moved along the plot. Silvia was trying to get information without sharing it with the agents assigned to watch her. In fact, she does learn some valuable information that changes her outlook, and ours, on what has gone before. Kidman and Penn both give good performances. Neither role seems particularly challenging, unless dialects are hard for Kidman, who speaks accented English and phrases of African languages on screen. Penn seems to inhabit his role more deeply, although a heartbroken cop is not exactly the role of a lifetime. Catherine Keener is the movie’s key supporting actor, and she’s a hoot. She has just the right attitude for her supporting part: smart-alecky, sharp, and competent. Pollack casts himself as Keller’s boss, and it’s distracting. Surely someone else could have played the part just as good, if not better, than the director. The worst flaws are in the screenplay and/or direction. The introductory scenes are overwritten, overplayed, and overscored. I’d rather come to know the characters than have them forcibly introduced on me. As an example, when we first see Penn he’s in a bar. His face says it all: severe depression followed by alcohol. That he fiddles with his wedding ring is enough to clue us in. But that’s only five seconds, and Pollack carries the scene out for another forty, spelling it out for us again and again. The worst is when he calls home to listen to the cloyingly cheerful female voice on his answering machine — a voice I’ve heard on lots of answering machines in movies, but never on a real phone. Another convention the movie follows is to introduce a theme and repeat it throughout. Ironically, the movie’s final message is one that it doesn’t live up to. A human whisper, it says, can be heard over an army, so long as it speaks truth. In the case of The Interpreter, truth is nothing more than the sum of all the facts, lined up like soldiers by the film’s rigid formula. If there were any whispers of human truth, they could not be heard over the din.